The new Steamist Total Sense Collection offers you a menu of steambathing products, including new options that touch the senses of sight, smell and sound. Your Steamist consultant will help you select and design the system that makes total sense for you. ● Can be installed with one or more Total Sense Collection Spa Options. ● Three models cover all steambath sizes. ● Multiple generators are easily "gangable." ● Selectable InstaMist™ feature provides quick-response steam in seconds. ● Proportional controlled steam modulated to precise steam shower requirements. ● Quiet, continuous steam output. ● Auto Drain designed to work with InstaMist feature. 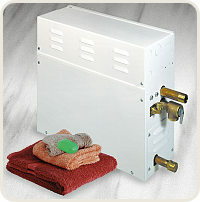 ● Auto Drain can be purchased separately or as part of a Control Package. IMPORTANT: When ganging 2 to 4 TSG steam generators together an additional 3199 steam head and 007-5158 control cable must be purchased for each additional unit.